Publication date: 5th August 2013. 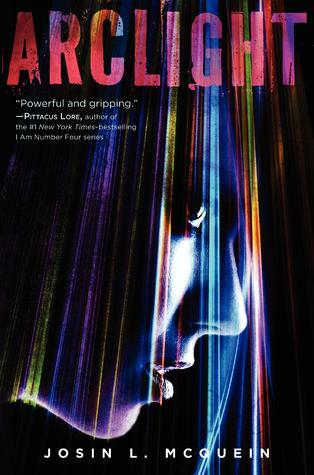 The Arclight is the last refuge in a post-apocalyptic world consumed by terrifying monsters called the Fade. No one crosses the wall of light that keeps the last human survivors safe. Marina can't remember anything about her life before she stumbled out of the Dark and into the Arclight. One of the main characters is called Marina. She is likeable but in the beginning I was left wondering what on earth she had done wrong to be treated the way she was by other people. Another leading character is Tobin (although I read the proof copy. Sometimes he was called Toby, and once he was called Tobias, so I'm not entirely sure what his name will be.) I wasn't sure what to make of him for quite some time, but eventually he becomes Marina's love interest. A character that stood out to me was Rue. For most of the book I didn't like him at all, but by the end chapters it became apparent that he had been very much misunderstood. In the beginning, I had no idea what was going on. I didn't know if it was set on Earth or another planet, or maybe even Earth but in the future. I would say this book is slightly Dystopian, which is a genre that I don't read enough of! It is also quite Sci Fi. The story is suspenseful and I didn't want to put it down - the author is very skilled at keeping a reader on the edge of their seat. Sometimes it wasn't clear who was speaking, but other than that it was very well written. At times it was bleak because you realise that all of the humans on the Arclight have to stay there for eternity. They can't go anywhere else because it's not safe. It definitely doesn't sound like a fun place to live! They're constantly on alert in case they're attacked by the Fade. I liked this story a lot and was disappointed to reach the end - I'm hoping there will be a sequel! It's really edgy and mysterious like nothing I've read before. I give this my highest rating of 5 out of 5 and I think it's one of those books that could be turned into a really gripping movie. I've won this book, but haven't got it yet, so it's great to see that you think it's so good! I can't wait to read it after reading your review. I don't like the cover very much, but I guess if it's a great book it doesn't matter :/ haha. Anyhow, great review and I'll be sure to tell you what I think about it when I get it! This sounds like something I would love! Especially seeing as the writer is skilled at keeping people on the edge of their seat. :) Is this the one you and Jack have loads of copies of haha? I got loads of copies of a book this one time and I didn't know whether to contact the publisher or not! Yeah, I have 3 copies of this including a proof and Jack has 2! I haven't contacted the publisher yet but I might. They always send me 2 or 3 copies of each book, it's a bit strange. :P Thanks for commenting! It seems like one of those post-apocalyptic books that doesn't quite fit into a certain genre. It does sound a bit dystopic and sci-fi like you said. And mysterious. I like that in a book. Great review, Amber! I was recently offered Arclight for review - I wasn't sure about it at first but now I think I'll try it out! Thank you Allie! You should definitely try it if it was offered to you, it's fantastic. This looks so good. I'm not typically big on sci-fi, but this looks like it will HAVE to be an exception!